This tutorial will highlight some of the devices that we have utilized in the Visible Heart Laboratory. 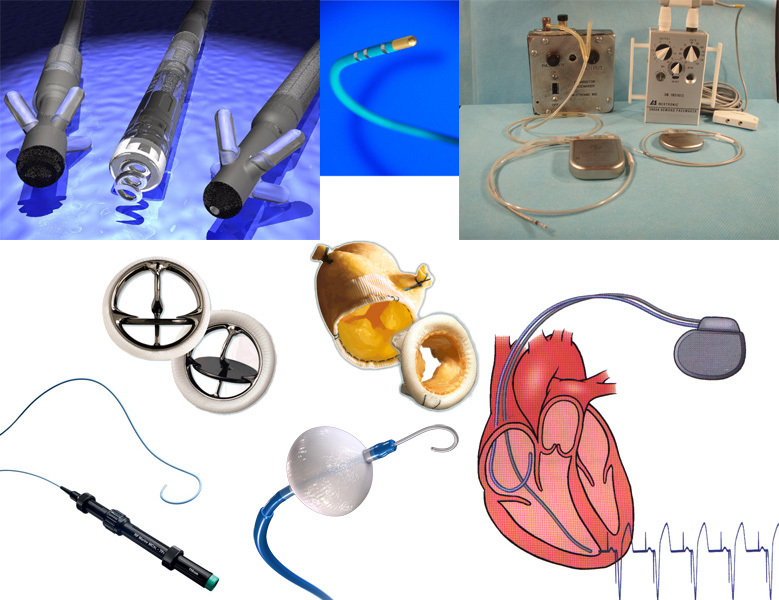 Catheters have numerous applications in cardiac treatments. They are used to diagnosis patients, deliver treatments, and implant devices. This tab contains videos of electrical mapping catheters, monitoring catheters, ablation catheters, and lead delivery catheters in functional human and animal hearts. Pacing Systems are used to deliver electrical energy to stimulate the heart in the form of pacing pulses or higher field voltages to elicit defibrillation. This tab includes videos of pacing leads, defibrillation leads, heart failure leads, epicardial leads, and lead extraction methods in functional hearts. Valve replacement is a treatment for patients with dysfunctional valves. The most common indications for a valve replacement are regurgitation (leaky valve) and stenosis (narrowed valve opening). This tab contains videos of surgical mechanical valve replacements, surgical tissue valve replacements, and transcatheter tissue valve replacements. A stent is a medical device made up of wire mesh that provides scaffolding to support the wall of the artery and keep its lumen open and free from the buildup of plaque. Balloon angioplasty and coronary stents have prevented numerous patients from undergoing coronary artery bypass graft surgery, which can be more costly and painful. This tab includes videos of stent deployment in the coronary arteries of human and swine hearts. The need for structural repairs of the heart can be due to congenital deformities or the progression of cardiac disease. These structural problems can be repaired during open-heart procedures requiring cardiopulmonary bypass, using minimally invasive surgical approaches (off-pump), or transcatheter delivery systems. This tab includes videos of mitral annuloplasty and the edge to edge procedure.